DipBrow Pomade is completely different to other brow products I have used before. It's not a gel, it's not a cream. What you have here is more of a gel-mousse hybrid. It is really creamy which makes it easier to work with. I have the shade Chocolate which appears to be the lightest of the three brown-based pomades. Shade-wise I did take a bit of a gamble but after seeing it on Morgan's blog I thought it'd be the best one for me. My brows are already quite dark so I wanted a shade that wasn't going to make them even darker and Chocolate is perfect (it's on my brows here). It is so easy to apply, you barely need any on your brush because it is so pigmented. I tend to brush this upwards through the front of my brow and then run the excess along the end. 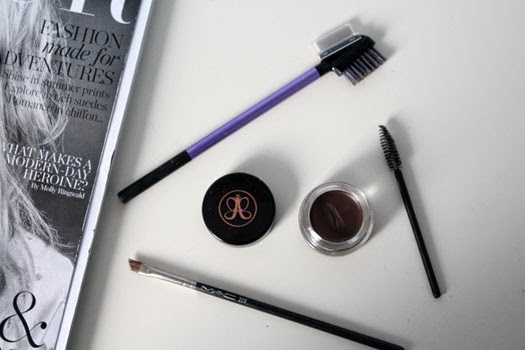 Sometimes I line this underneath my brows as well to keep things looking a little bit neater. DipBrow Pomade does set and once it's in place it won't budge, until you come to remove it later on. I'm so glad I purchased this last month. It's all I've been reaching for lately when I do my brows and I love how it leaves you with brows that look a lot tidier without looking too overdone. It's so easy to work with too. You can buy it online now from Cult Beauty or if you're in Auckland, Lash Noir in Ponsonby are selling this so give them a ring if you're interested in it. -Have you tried DipBrow Pomade before? Did you like it? *There was one incident where I did not have aforementioned wipes and had one awkward bus ride home. I'm sure people weren't really staring at my overly drawn on eyebrows but it felt like it. They looked awful! Moral of the story: Always have wipes. my current brow product is gimme brow simply because im such a noob and i find easy to use haha! and im the same with my eyebrows, i hate it when they look to drawn on. might have to add this to my wishlist, great post sophie! I hear you on the brow grooming habits loud and clear. No matter what I fill in my brows with I am CONSTANTLY brushing through and obsessing over making sure they look natural and not like all those memes we see. You know the ones! I'm yet to try the Dip Brow but it's on my list. At the moment (for quick jobs anyway) I like getting my spoolie and dipping it into my brow shadow to kick up some product into the brush then running that pigment through my brows then setting and forgetting. Uber natural, quick, and it always looks good. I tried to get my hands on this at Sephora, but had to join the waitlist as well. With the summer heat quickly approaching, I went for the Tarte Amazonian Clay Waterproof Brow Mousse instead. I love it!